American Paint Horses are highly valued for their color and markings, but also a favorite for their unique refinement and intelligence. They have long been used in performance competitions as a show horse. American Paint Horses comes in various colors, including bay, chestnut, black, palomino, gray, buckskin, and blue roan. Plus they have distinctive white markings. The marks vary in size but the patterns are standard. The two predominant coat patterns of Paint Horses, the overo and tobiano, are distinguished by the position of the white coloring on the body. Overo (Spanish, for “like an egg”) patterned horses have white spots extending across their back between the withers and the tail. Typically, all four legs are dark-colored, but in order to be considered, at least one leg should be dark in color. Scattered and irregular white markings also appear all over the body. Tobiano-patterned horses have a solid-colored head with a white spot at front, which can be of various shapes (e.g., blaze, star, etc). Their legs are white, with an appearance of white stockings. 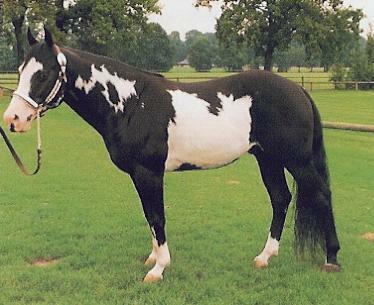 Apart from these distinctive markings, the spots on the rest of the horse’s body are in sharp contrast to the colored areas. These markings are commonly found on the neck as well as the chest. Spotting may be oval or round, and the amount of white varies as well. Some Tobianos have a large amount of white, while others have so little white that they appear not to be spotted at all. Tobiano horses usually have dark brown eyes and bicolored tails. Around 500 A.D., during the invasion of the Roman Empire, several barbaric tribes brought spotted Oriental horses from Eurasia to Spain, where the spotted horses were interbred with the native horse stock. The breed thrived in Spain, and began to resemble what is commonly referred to as the standard Paint Horse markings. Records dating back to 700 A.D. show the spotted horses that have the standard tobiano and overo patterns. In 1519, the explorer Hernando Cortes carried two horses described as having pinto markings on his voyage. This is the first known description of such horses in America. By the early 1800s, horses with Paint coloring were well-populated throughout the West. Throughout the 1800s and into the late 1900s painted horses were called pinto, paint, skewbald, and piebald. In the early 1960s, interest grew in preserving and promoting horses with paint coloring and stock horse builds. In 1965 the American Paint Horse Association formed, and today, the American Paint Horse is extremely popular in traditional stock-horse western events as well as a variety of other riding disciplines.